When should I plan to visit Russia? 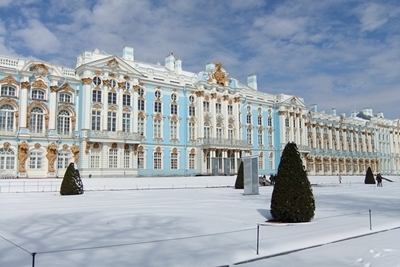 Is it feasible to travel through Russia in winter? What does Russian cuisine offer? 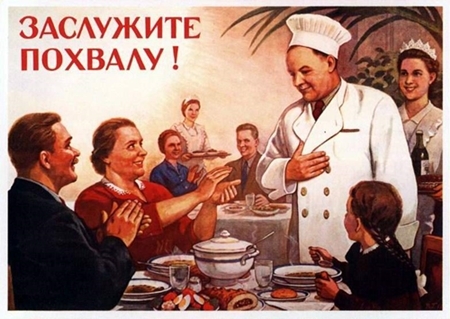 The traditions of modern Russian cuisine are closely connected with the food cooked by peasants during the Russian Empire period. Basic dishes haven’t changed. However, nowadays when people don’t have enough time to cook at home, they prefer fast food, cafe food, etc. Nevertheless, food and beverages served at home are almost the same as they were several hundred years ago. Russians are very hospitable. When you travel through Russia you will experience the range of food and beverages on offer, especially during holidays and festivals. Usually, there are three main meal times: breakfast, lunch and dinner. Main courses are served at lunch and dinner. Meals first include soups and it’s impossible to imagine a Russian dinner without them. There are different varieties of soups: shchi (cabbages with meat), rassolnik (hot soup of pickled cucumbers), ukha (boiled fish), okroshka (the ingredients aren’t boiled but put in kvas or sour milk; it is usually made in summer), kasha (porridge) prepared from any grain (buckwheat, rice, wheat). Most soups are served with smetana (sour cream). Though Russia is a large country, these soups can be easily found almost in every corner. Other popular dishes are made from meat (sausages, pelmeni, chops, steak) and of course potatos. There are also different salads made from seasonal vegetables and fruit. Don’t forget that most food is served with bread as this is the most essential thing in Russian cuisine. In Russia, as elsewhere, people drink tea and coffee for pleasure. Amongst traditional alcohol-free beverages are prostokvasha, kvas and kompot (stewed fruit). Vodka and samogon are the best known alcoholic drinks. Why would you choose to cross Russia by train? Utter the name “Siberia”, and it immediately conjures up images of winter. And given a good hard frost, nothing is more beautiful than chugging across the flat snowy wastes of Russia, the firs and birches glistening white. Or, strolling along streets of huge cities or provincial towns in deep snow and experience iney – when the air sparkles like tinsel as it freezes. 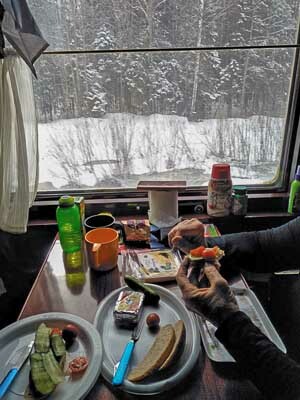 Of course, Russia and the Trans-Siberian route offer a host of delights at all times of the year. Summer offers lush green forests, sunbathing and boating in lakes and rivers, homegrown produce being sold on the streets. Autumn and spring reveal a kaleidoscope of colour, with birches changing foliage and wild flowers. Whatever your season preference, a rail journey throughout this vast continent cannot fail to delight travellers who want that elusive “something different”. How do passengers pass the time on these long journeys? When you spend more than two days in the train, it becomes a second home. You start to know the conductors and are spending more time with other passengers. Life on the train drifts from stupor to frenetic activity, from relaxing to bursts of platform shopping or dashing around the station. You sleep when you want to but gradually you drift into a routine centred on stops, eating or bone-idling. The Trans Siberian is the big-book trip, attempt War and Peace or devour the Lord of the Rings. Window gazing is meditative, good for daydreaming and problem solving. Compartment windows don’t open but some in the corridor will. For private space there’s the restaurant car where a good relationship with the staff (encouraged by a small gift from home) will leave you undisturbed. Make friends and don’t be daunted by not knowing the lingo. Most communication is non-verbal, a warm smile is a good start and a phrase book will supply the basics. Other English-speaking foreigners will probably be travelling as well. Play games, learn or improve your chess and consider packing backgammon or cards. Follow the journey, a map and guidebook helps make sense of this momentous transcontinental journey. A schedule is posted in every carriage so if the train is running on time you should know where you are. Films. A laptop or video player plus DVDs will endear you with your fellow passengers and the provodnik (carriage conductor, and usually a woman). Good relations with the provodnik is essential for that morning cup of tea in bed or her not minding you recharging your gear from the only plug in the carriage that’s for her vacuum cleaner. What is the food like aboard the Trans Siberian? Restaurant car quality is variable. 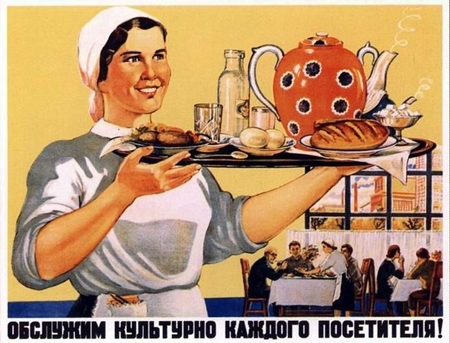 Sometimes the staff are graduates of the Soviet School of Inhospitality majoring in surliness, indifference and awful food, while other times they’re really sweet and dish up tasty food. Food and service improves dramatically in the Chinese restaurant cars. The train runs on Moscow time, outside it is local time but the restaurant cars seem to have another time zone, so check meal times. Many passengers prefer to cater for themselves with the ever-boiling samovar at the carriage end providing hot water for drinks and pot noodles. Most stops have platform hawkers clamouring to sell fresh bread, fruit, vegetables, hard boiled eggs, tins of sardines, instant noodles, bottles of home made vodka, dried fish, toys and clothes. Platform kiosks provide the rest; forget the old images of Soviet-era queues and empty shelves, these are well stocked especially with varieties of beer and kvas – a popular drink derived from fermented bread. You will see kvas vendors all over Russia – quite a refreshing drink with a very low alcohol content. What about stops along the way? Stops vary from two to 40 minutes. Always confirm the stopping time with the provodnik and make sure you ‘go’ well before you pull into the station as toilet doors are locked when passing through towns and cities. Forty minutes is too short for a city tour so keep within the station and return with time to spare. The horror of seeing the train leave without you is the opener for too many train travel stories so always carry your passport, ticket and money with you. 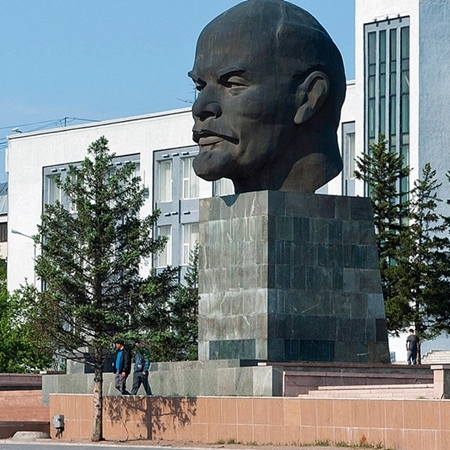 There’ll always be plenty of characters and maybe a Lenin statue or similar Soviet relic to photograph. Don’t, photograph anything military or involving the police without asking, or you will be missing the train. At the longer stops, you’ll see the ‘houseproud’ conductors polishing doorway handrails and the train nameplate on the carriage but never the dirty windows. Meanwhile a railway worker, swinging a long handled hammer taps the wheels and wheel bearing boxes with a musical ‘ping – pingpingping’ meaning a healthy wheel. How can I read my Russian train tickets? Can I stopover during a long distance train journey? No multi stopover tickets are sold – travel A to B and get on and off at will. Each sector (before and after each break in the journey) requires a separate ticket. What are the different Trans Siberian train types? FAST TRAIN (skory poezd) – trains are numbered from 1 to 160. Relatively comfortable and fast trains with minimum stops – only the larger stations. The same as above, but with cleaner carriages and potentially more courteous attendants. Ticket prices on these trains are higher than the others. PASSENGER TRAIN (passazhirsky poezd) – trains numbered from 170 to 870. SPEED TRAIN (skorostnoj poezd) – Trains numbered from 161 to 169. 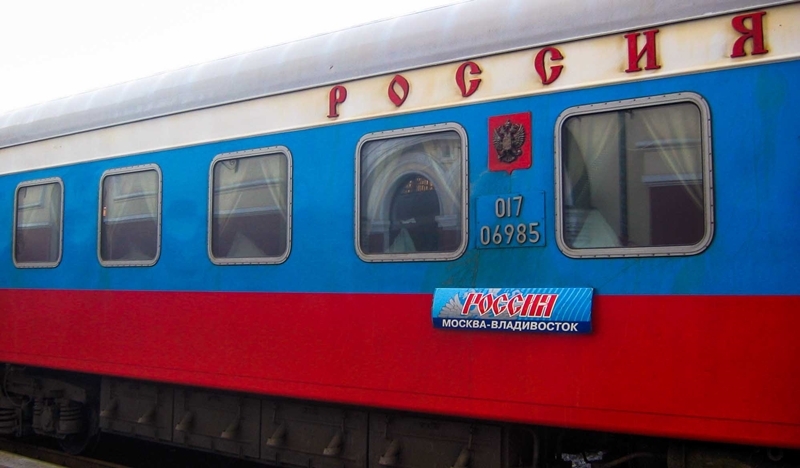 Each train comprises 7-18 sleeping carriages of mixed types (sostav or poezd) plus special-purpose carriages for baggage and the restaurant carriage. There is also one carriage for the train superintendent – head conductor (nachalnik poezda). This carriage usually has a large looped radio aerial on its roof, and is typically placed in the middle of the train. What are the daily routines aboard the trains? Getting to your train: Your ticket will indicate the train (poezd) number, wagon (vagon) and compartment (kupe). People meeting you will often ask for your compartment and wagon number. Russian trains are long, so it is handy to have someone there where you down. The lower the wagon number, the closer to the front of the train, and the further down the departure platform. Porters (nosilshchik) expect no less than EUR4.00 in rubles from foreigners for one or two bags. Indulge yourself, because “Wagon Number 1” is a long way down the platform. Agree on a per bag price before they start helping you. Note: Russian trains leave on time! The carriage (wagon) and its attendants: Whatever class of travel you choose will result in you having a pair of attendants (‘provodnik‘ (male) or ‘provodnitsa‘ (female)) working in shifts. Shortly after departure, he/she will take your ticket and ask for the small bedding fee – about US$1. Bedding, which consists of two sheets a pillowcase and a towel, is handed out in sealed packs. Blankets and mattresses will already be in your compartment. the attendants small room is at the front end of each carriage, next to the toilets and the hot water boiler (coal fire powered ). Part of their job is to walk along the corridor and make sure everything’s in order. They also prepare cups of tea (chai) for 4 Roubles. In addition, they get off at every station and remind passengers (in Russian and hand signals for the tourists) not to stay too long on the platform. For good service, a small tip (EUR1.00 in rubles) at the end of the trip is appropriate. A boiler with unlimited free hot water is available at the end of the corridor. A good idea is to bring your own tea (if you don’t think you will like the local brew) or coffee (not supplied on the train), sugar, cuppa soups, drinking chocolates etc. If you do this it is best to have your own cup/mug. Most long distance trains have a restaurant car serving drinks, snacks, and full meals. Budget on US$12 to US$15 for two courses and a drink or two. Toilets discharge onto the track, so they are locked about 30 min. before arriving at stations until about 30 min. after departure. Life aboard the Trans Siberian is free and easy but there are a few protocols. All carriages are non-smoking and smokers have to use the connecting passageways between the carriages. Dressing down is standard; most locals travel in daggy tracksuits and ones with stripes down the legs being the most favoured. But, they are the most practical clothes to travel in along with a pair of slip-into shoes. In mixed compartments, the men wait in the corridor while women prepare for bed; men change into their nightclothes in the toilets, or the women turn to face the cabin wall. While you can go to bed and get up anytime, the bottom berth in a four-berth kupe is also seating for two so bear that in mind when you decide to lie in; alternatively ask for a top bunk. Compartment picnics are shared affairs. Everyone lays out the food they’ve bought, the vodka does the rounds, toasts are made to international friendships and everyone tucks in. What cabin types are available on Russian railways? Russian trains have 3 classes of travel. 2-berth with 9 compartments per carriage. Both beds at the lower level. Washroom – hand basin only with hot/cold water, and toilet are at either end of the carriage. TV (Russian only) currently only on the Trans Siberian train ‘Rossiya’. 4-berth with 9 compartments per carriage. Washroom – hand basin only with hot/cold water, and toilet are at either end of the carriage. We no longer take bookings in this class as over the years there have been too many complaints as well as security issues. What are the washrooms like aboard the Trans Siberian? Most Russian trains have toilets which discharge onto the track, so they are locked about 30 minutes before arriving at stations until about 30 minutes after departure. They can (and do) vary according to the train, age of carriage, efficiency of the carriage attendants and duration of the journey. They are a lot better than what they once were!!! The Chinese Train (No 3 and 4) have a 1st class (2 berth) cabin configuration different to Russian trains. They have two cabins interconnecting to one shared bathroom which has a shower head. 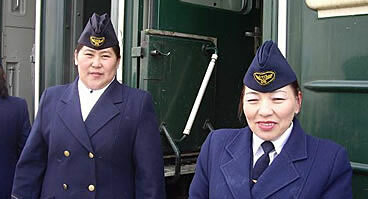 All Mongolian and standard Russian trains have a toilet and handbasin (hot and cold water) cabin at each end of each carriage – NO shower unit. Some of the newer long distance trains (Train 1 or 2) are starting to have a shower available (one) and its use is governed by the payment given to the attendant. It is completely random as to which train such a carriage is attached. The provision of a shower on such a route can never be guaranteed, or ascertained in advance. If a higher standard of comfort and privacy is important to you, please consider our Luxury Private Train options. What about personal security aboard Russian trains? As long as you use common sense, lock your door at night and don’t leave valuables unattended in your compartment – same conditions as on other European trains – you should not encounter problems. Most stations have left-luggage rooms or self-service lockers. Your friendly provodnitsa may be able to lock the compartment when you plan to step down onto the platform to stretch your legs. In addition to the normal lock on the door, Spalny Vagon and Kupe compartments have a security latch which stops the door opening more than an inch or two. This is designed to not be released from the outside. You can take a small cable lock and place it over this arrangement for further peace of mind. Trains in Russia are generally more secure than the city streets. There are policemen (militsioners) on most trains. If you have problems ask the conductor to call them. If there are no policemen on your particular train, they can be called at the next station. If you are having any problems with the local conductor (unusual), then you need to contact the Train Master (“na`chalnik `poezda“). He is usually located in his compartment which is usually based in carriage 6 or 7. General Distress Call: In the very unlikely event you experience a problem, or are hassled by someone cry: “Pozhar!” (Fire!). This will rouse the most lethargic! Do I need a visa to visit Russia? Most nationalities require a visa. Australian citizens should apply through the Russian Consulate-General in Sydney. NZ citizens apply at the Consulate in Wellington. Local registration is also required on arrival in Russia. May I take photos everywhere in Russia? Best not to attempt taking pictures at frontiers or borders, or whenever police or the military are close by. Be discreet inside churches, as some worshippers may object strongly. As elsewhere, a smile and a questioning gesture will usually elicit a clear yes/no from your intended subject. How prevalent is street crime in Russia? 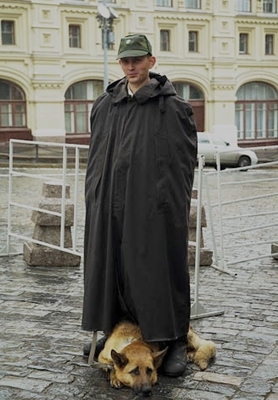 Street crime encountered in Moscow or St Petersburg is, broadly speaking, at similar levels to other large cities around the world. What should one do to avoid it? As in London, Paris or New York, be alert to possible pickpockets or bag snatchers. Be alert to such scams as mess spilt on your shoes or clothes; don’t try to intervene if you spy wads of money or other valuables lying on the pavement. 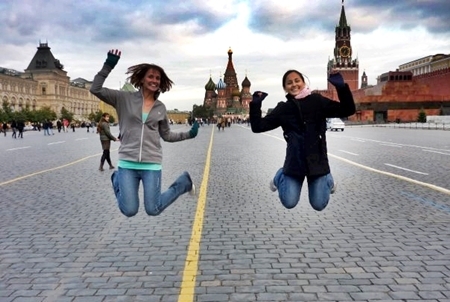 Is corruption a problem for travellers in Russia? Corrupt police or other officials – or impersonators – may accost you in public places, and demand to inspect your papers, in search of bribes. As a precaution, carry copies, not originals, of your passport and visitor registration papers. If accosted, try to stand your ground, politely but firmly. If you suspect you’re being extorted by a police officer or other official, offer to walk with them to the nearest police station, where you can verify their identity and their demands. Do racism and discrimination exist in Russia? Unfortunately, the honest answer has to be ‘yes’. Xenophobia and racist attitudes may be encountered by foreigners, particularly those of African Asian, or the Caucasus origins. Fortunately most Russians will prove genuinely hospitable once their initial reserve is overcome. Most visitors require a visa, although short visits visa-free are now allowed in some circumstances (not airport to train station). Australian, British, Canadian and European residents please visit China Visa Application Center. NZ residents please visit the Chinese Embassy, Wellington. Is crime likely to be encountered in China? In China’s major destinations, and particularly in areas frequented by tourists and expatriates, you may encounter pickpocketing, purse snatching and other forms of theft. Robbery and assault have been reported from nightlife and shopping precincts and on long-distance overnight transport. What sort of scams are directed at foreigners? Do not accept invitations from strangers to visit a tea house or massage parlour, as you risk demands for large sums of money. In major cities, be alert to such scams as mess spilt on your shoes or clothes (we’ve encountered this one in cities from Shanghai to Santiago de Chile). Never, ever, carry packages or bags on behalf of other people – and particularly not virtual ‘friends’ who may have invested months in winning your trust online. Are there any problems obtaining cash in China? ATMs (cash machines) in some cities and public places in China – even international airports – may carry Mastercard or Visa logos yet will not deliver for foreign cardholders. Look for a machine linked to another bank, preferably located within a secure place such as a bank building or a shopping mall. Sophisticated point-of-sale payment mechanisms are now widespread across China. Bank of China offices are good in the more remote places and you can still change cash in these banks. Another easy option is the cashier at the hotel desk. What do I need to know about Mongolia? What sort of weather should I anticipate in Mongolia? Do I need a visa to visit Mongolia? Mongolian visa procedures are usually straightforward. Please visit the websites of the Mongolian embassies in Canberra, London or Washington DC; or the Consulate in Auckland. Where can I find out more about Mongolia? 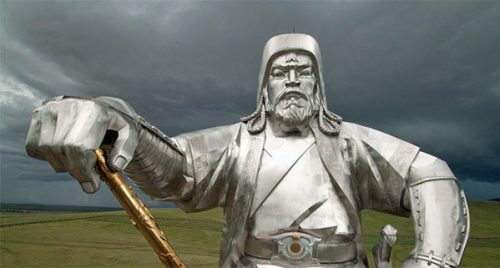 Please visit our comprehensive Mongolia pages here. More specifically, the ‘Stans’ of Central Asia are the former Soviet ‘republics’ of Uzbekistan, Kyrgystan, Kazakhstan, Turkmenistan and Tajikstan. (We’ll leave Afghanistan right off the list, for now). These ancient regions have been at the centre of the ‘Silk Road’ since the route first came into being. After the downfall of the Soviet Union, their national character is once again establishing itself on the world stage. Facing immense problems related to economics, internal corruption and environmental issues, their opening to tourism starts to put a value on their cultural and environmental resources. This area is still to be considered ‘basic’ in its infrastructure and to some of us this is what appeals. For those who require higher standards, at least you are pre-warned and so should enjoy it more when visiting; or consider our Luxury Private Train offering. 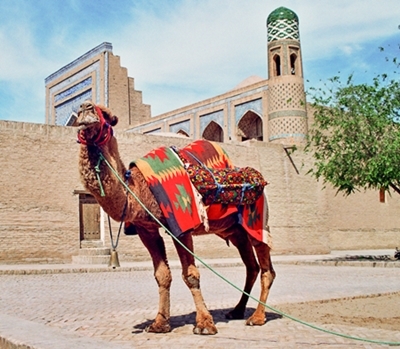 SAMARKAND The ancient capital of Tamerlane’s Empire. Today the monuments of that time still impart awe upon visitors, with their shear size, mosaic work and architectural symmetry. 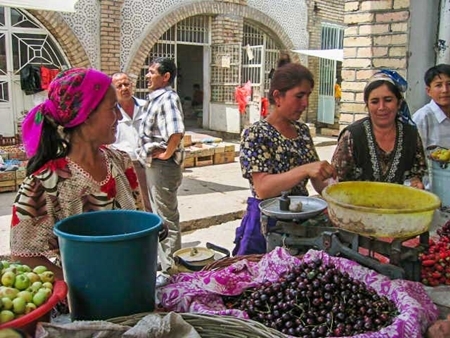 To wander the ancient streets of this city and then to browse amongst the stalls of the bazaar are but some of the pleasures to await the visitor. And then there are BUKHARA, KHIVA, TASHKENT and ALMATY (the former Alma-Ata) awaiting your discovery. The 7000 metre PEAKS For hiking and climbing enthusiasts this area contains some famous names. The Pamir Range is home to such peaks as Lenin Peak (7,134 metres) and Communism Peak (7,105 metres). The Pobeda Peak (7,439 metres) and Khan Tengri Peak at 7,010 metres form part of the Tien-Shan range. Naturally mountain climbers can climb these peaks and hiking enthusiast can hike in the areas observing these grand mountains from lower altitudes. The PAMIR – ALTAI This land of lakes and mountains with great natural beauty lures many outdoor enthusiasts to this area during summer months. Hiking in this area provides a wealth of experiences to the visitor with opportunities to meet local nomadic tribes. This area is known as the ‘Asian Patagonia’ with its pointed peaks, vertical rock walls and imposing glaciers. There are a wide variety of travel options for these historic areas. In past years we have stated that the area was overpriced and too restrictive. We also said that things change, and change they have. Travel is now a little easier and costs are more reasonable – not perfect, but manageable. Some of these countries have recently eased or even eliminated once-onerous visa requirements. Does my government offer any useful advice or safety warnings? Many governments offer their citizens detailed travel safety advice online, usually indexed by country name. Australians should visit Smartraveller, DFAT, Kiwis SafeTravel, Britons the FCO and Americans the State Dept.